Human resource service company provides information on automated time keeping, Work Opportunity tax credits and other services. 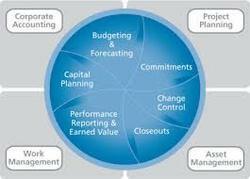 Cost management is the process of effectively planning and controlling the costs involved in a business. ... The process involves various activities such as collecting, analyzing, evaluating and reporting cost statistics for budgeting. - Decision making such as Make or buy; manufacture or outsourcing / leasing of capacity decisions. - Verification & valuation of inventory, material reconciliation. Businesses run on a success stories and success are created through a well defined business plan. Today, in the fast paced business world, your ability to manage technology services is the key to remain in business. The catch phrase remains, Cheapest, Fastest and Sustainable. Stalwart ensures identification of all parameters to estimate robust costs at feasibility and incorporations of costs for phasing with thorough understanding of client’s financial protocols and requirements. Identifies commercial risks associated on the project and mitigates with transparent contingencies on cost plans. Prepare preliminary cost estimates, Initial budget and BOQ at the Schematic stage and continually analyses and update the project at the Pre lunching stage. At Construction stage, detailed BOQ including BBS for tendering and contract management as well as monitor and report cost issues for effective and professional cost management of the project. - Cost reduction and value analysis, Valuation of stocks transfer pricing valuation. Escalation in cost is the major handicap in planning. It is usual that the estimated and executed costs vary largely. The cost management team of Wood peckers endeavors to reduce this variation to the least minimum. Pro-Active's management team brings in specialist expertise when it comes to cost model building. This expertise has been honed over projects at diverse industries and business processes. We involve in determining the polices, procedures, documentation that will be used for planning, executing and controlling project cost. Change order Process Tracking of Budget . Project Cost Monitoring .